... 1922 (90 years ago today), pursuant to Article 22 of the League of Nations Covenant, lands that Germany had controlled until its defeat in World War I were allotted to victorious Allied Powers. 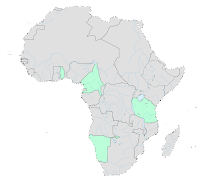 (credit for map showing German colonies circa 1913) For the most part it was France and Britain that were designated "mandatory authorities" charged with administering these African territories. Divided between them were areas formerly known as Togoland, Kamerun, and German East Africa. A small portion of that last territory would be mandated to Belgium the following year; a small triangle to the south of it was mandated to Portugal on this day.